Did you ever wonder how a scientific conference or summer school is organized? Who selects the speakers and more importantly, who decides which abstracts are selected for a presentation? And what are the criteria for the poster awards? 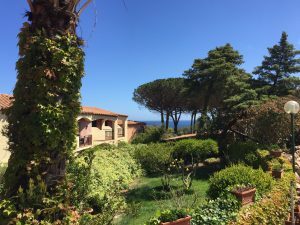 Well, during my visit to the ENII (European Network of Immunology Institutes) Summer school of Immunology in Sardinia a few weeks ago, I became curious and decided to interview the scientific organizers Prof. Dr. Maries van den Broek and Prof. Dr. Jannie Borst to ask them about their work before and during the summer school. How did you become scientific organizers of this summer school? The scientific organizers are selected on a voluntary basis from the board of the summer school. The board of the summer school is changing slowly. We try to get some new people in if other people drop out. The original board consisted of members involved in a European Community grant. One of the regulations was that we had to spend a certain amount of the budget on teaching. This is why we discussed a lot within the consortium at that time and came up with the idea of a summer school, which we started 12 years ago. It was funded for the first 2 or 3 years by the European Community through this spreading and teaching budget and by then, we already had a bit of a reputation. People came back from the summer school and spread the word, so that new students would register in the next year and we never really had to advertise. Now, the board consists of those original members and Jannie, for example, is one of the new board members. We select the organizers of the next summer school in mutual agreement during a board meeting. How would you describe your task in the organization of the summer school? First of all, we take care of the scientific program. The scientific organizers determine, in collaboration with the board, whom to invite as a speaker. How do you select who to invite? That is a good question. We try to cover most topics, which is hardly possible of course, but we really try to distribute talks to each subject equally and not focus too much on one particular topic. Topics meaning certain diseases, cell types, processes and so on. Recently, there was the discussion that the school was focusing too much on cancer, but it was actually looked at from different perspectives. That is why, we still thought it acceptable. In general, we try to cover the breadth as well as the different branches of the field, focusing on the different cell types but also the clinical aspects using mouse models and human samples. However, one of the main criteria is that every chosen talk has to contain mechanistic studies, not descriptive ones. So, we are not looking for very clinical and descriptive studies but for studies focusing on the molecular and cellular mechanisms at different levels such as on organismal level or in vitro. That has always been a guideline for this summer school. And secondly, you need to find people for these topics. Because we think that the spirit of the school is really unique we find it important that at every meeting a particular number of board members is present to transmit this spirit and make sure we keep it. Then, we always ask for a substantial amount of additional speakers. The first time we invite someone, we invite them because someone knows that they give good talks, they do good work and they probably like to interact with students. Then, you have your evaluation forms and we take them very seriously, so teachers that are not well appreciated by most of the students are not invited again. That is how we try to build up a kind of faculty that covers different subjects and that we can mix a bit around every year so that we always have an attractive program. How long does the whole organizational process take? The new scientific organizers are already decided upon during our board meeting here at the summer school. Additionally, the preliminary list of speakers has already been discussed. As people are very busy, the speakers from this preliminary list will be invited and depending on the feedback from these people, other people need to be approached. Furthermore, because we think that the concept of the school is quite good, it will be more or less the same each year. As soon as we have the speakers confirmed and the hotel has confirmed the dates of the school, there is nothing we need to do for the moment. The registration is handled by the school coordinator Barbara Fricova and the logistics is done by executive manager Erica Lomnes. They start working quite early and we as scientific organizers join in later around March of that year, which is about 2 months before the summer school. So, it is an important task but not a very heavy workload. How do you decide which abstracts to select for the talks? Well, you read them first, of course, and sometimes we know, for example, if it is a first year PhD student. If this fact goes together with sentences like ‘we plan to evaluate’, ‘we try to test’ or ‘we think of doing’, then we think it might be still very interesting work but it probably will not have sufficient data yet for a presentation. As you may have noticed, sometimes we still select abstracts that turn out to be very preliminary, but that can be hard to see. Also, we try to cover the different topics. If possible, we try to avoid selecting too many people from the same country or university. Also, we really want to give people from countries that may have financial and equipment limitations a chance to show their work if it is well conducted. Quality is the first criterion. It is of course not one person but multiple persons selecting these abstracts. We always have three people doing this. Actually, the board members are asked via e-mail if they have time to review these abstracts. Then an independent ranking is set up by each reviewer and added up together, so that we have an overall ranking. What are the criteria for the poster awards? It is just one: Excellence! It is the quality of the data and quality of the presentation at the poster. It is very important that the person at the poster is indeed in command of their subject. If you look at the data, you have to see that it is solid, that people have not over interpreted it and that they really have the results that justify their conclusions. Of course, it is nice if it is a round story, but it does not have to be. You can judge whether a person is in command of their subject by their ideas, whether they take on board what you are saying and whether they are citing papers to you. I agree, a good discussion part at the poster is essential. If you ask something and they do not agree, that they have the arguments to argue with you. So, we actually test the scientific quality. And also with regards to the presentation, you look at what the poster looks like. However, if there are one or two flaws but presentation and discussion at the poster is eminent, we overlook these flaws. Why should a PhD student attend this summer school? What are its specific features/advantages? I can summarize it in one word: Spirit! Yes, that is what you will find here. I am proud of the fact that we try to make this a warm place, where you feel free to talk and free to discuss. You could go to many other places such as big conferences in the US, where everyone is protecting their data. But here, we have shown you a lot of unpublished data in the trust that you treat them respectfully and that is the kind of spirit we want to exude. I think it works because if you give, you get something back. We do not want to cuddle you though, we are pretty harsh judges, but it is all honest. And that is the thing. You do not want to put people down because they do not know something, you would like to hear them tell you what you want to know or what they do know and, of course, it is extremely enriching for us as well. That is the nice thing about it. Do you have any final words, to sum it up? Final words, not really. But I hope we can continue like this and, I hope that the students have met many people that will stay in their network for a long time. In the end, I wish everyone that they stay curious. On that note, there will be an Alumni meeting at the next European meeting of Immunology in Amsterdam at a specific location, where people from the ENII summer schools can meet each other again. All together, I think for me it is a pleasure to participate, because I learn a lot. I always find it great to see young people who are eager and want to get ahead and do something with their lives. Thank you very much, it was lovely talking to you!